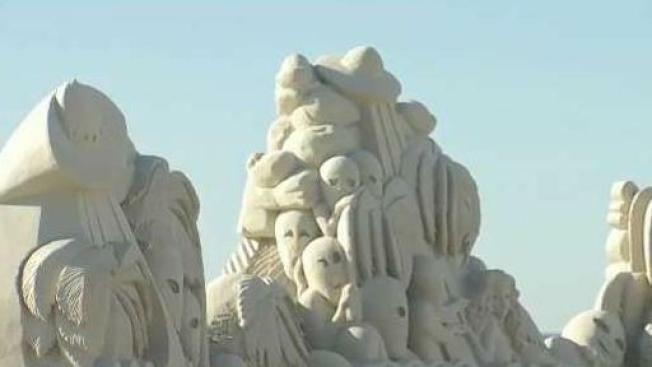 The 18th annual Sand Sculpting Event kicked off Thursday at Hampton Beach in New Hampshire. The competition, which runs through Saturday, highlights the work of more than a dozen artists. The 18th annual Hampton Beach Master Sand Sculpting Classic is underway in New Hampshire! The event continues through Saturday. Competitors from around the United States and Canada descended onto the beach early Thursday morning, each vying for the $3,000 grand prize. The sand used for the competition is specifically brought in for the event. Each artist gets to use 10-tons. John Kane of the Hampton Beach Village District says he expects huge crowds, especially on Saturday, when visitors can vote for the "People’s Choice Award." If you can’t make it to Hampton Beach this weekend, the sculptures will remain on display until June 27.